The medal recognises the track record of the institution, which has become a key player since its arrival in Spain in 2011. 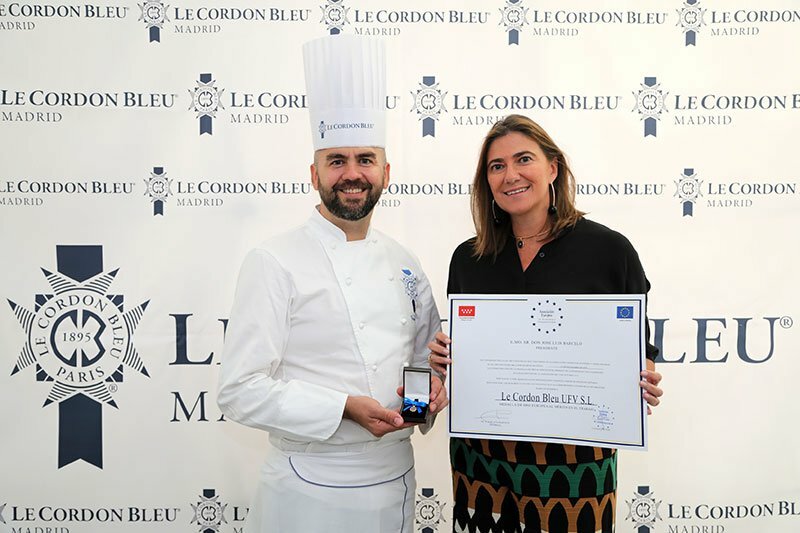 Madrid, September 14, 2018 : Le Cordon Bleu, the leading Global Network of Culinary arts and Hospitality Management Institutes, in partnership with the University Francisco de Vitoria (Madrid), received the “Medalla de Oro europea al mérito al trabajo” (European Gold Medal for merit at work) from the European Association of Economy and Competitiveness, presided over by Mr. José Luis Barceló. Mr. José Luis Barceló, The President of the Association, and Mr. Juan Ignacio Navas Marqués, Vice-President, counsellor of the Kingdom of Spain and Master in European Law, handed out the medals and ribbons to Le Cordon Bleu Madrid, represented by Rosario Barrios, General Manager of the Culinary Arts and Hospitality Management Institute. Le Cordon Bleu Madrid opened its doors seven years ago, alongside other openings in Latin America. Since then our partner, the University Francisco de Vitoria (UFV) has shared the same vision and values. In this commitment to quality we have developed together Bachelors and soon a Masters degree. Le Cordon Bleu is thrilled to be awarded this Gold Medal, honouring its success in delivering high level education in the Spanish capital, and celebrating a strong relationship with UFV..
Well known for its prestigious diplomas in Cuisine, Patisserie and well as the Grand Diplôme®, the most complete programme offered by the institution, Le Cordon Bleu has alliances with some of the most important universities in the world, such as the UFV, which has enabled it to take gastronomy to the highest level. The mission of the European Association of Economy and Competitiveness (AEDEEC, initials in Spanish) is to promote, develop and recognise those people and institutions that promote good business development within the European framework. The AEDEEC is thus focused on identifying and recognizing all those actions and measures carried out by companies which serve as an inspiration and stimulation. The European Gold Medal for Merit at Work rewards and celebrates the success of both Spanish and European companies that support business spirit and awareness with their initiatives and practices. All the companies and professionals that receive the award become a benchmark and a model to emulate in their sector, both nationally and internationally.